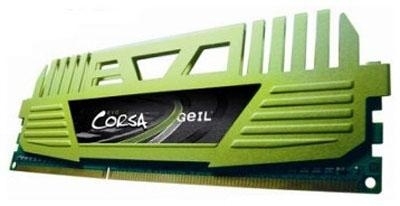 Golden Emperor Industries Ltd or GeIL introduced two new DDR3 desktop memory modules, the GeIL EVO Corsa and Ehance Corsa DDR3 memory. These two new memory modules are made and designed to cater gamers and enthusiast alike. Evo Corsa and Enhance Corsa are available in dual-channel kits and quad-channel kits. GeIL did not make any tripl-channel kits for Evo Corsa and Enhance Corsa maybe because the LGA1366 or X58 chipset, which utelize triple-channel memory kits, will soon end and be replaced with the LGA2011 or Sandy Bridge-E. Check out the specs below. As you can see in the specs above, the Evo Corsa has a better specificatio. This is because Evo Corsa was designed primarily for overclockers. They were exposed to high DRAM voltages and prolonged operation under high voltages to make sure Evo Corsa runs perfectly all day long in overclocked profile.